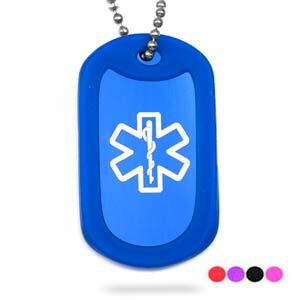 Keep the whole family safe with these attractive and lightweight dog tags! A selection of five colors allows for everyone to pick out something he or she will actually wear! Each dog tag comes with a matching silencer and a chain in several lengths - including a 4 inch size for backpacks. A name can be engraved below the medical symbol on the front while the back has plenty of room for any other information.